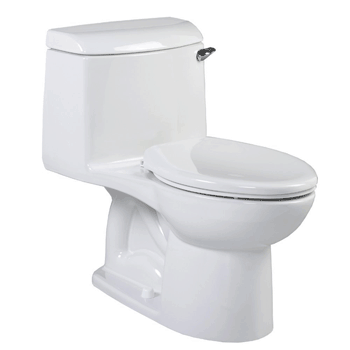 Are you on the hunt for a new toilet for your basement? If so, you might want to check out the Saniflo Sanibest Pro. This is a really awesome toilet and macerator chamber combination. Here, you will end up saving a whole lot of water no doubt. This toilet grinds your waste into tiny particles and can shoot it up vertically up to 25 feet below the sewer line. It will help you save water, money, and a big hassle too. Let’s take a closer look at the Saniflo Sanibest Pro and see what it is all about. The Saniflo Sanibest Pro is designed quite well. First off, here you get the toilet itself, which is made out of your good old porcelain, and industry standard. It is tough and easy to clean, both bonuses no doubt. You also get the toilet seat and lid here, both of which are made with coated plastic, which is once again an industry standard. The macerator chamber is also made with porcelain, and the interior features various metal, plastic, and rubber components to power the pump, macerator, impeller, and grinder. 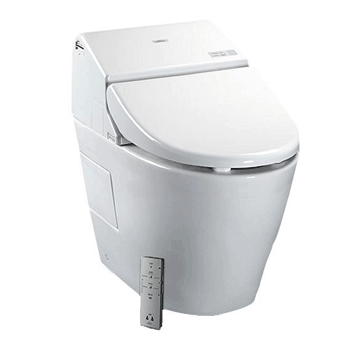 All in all, the Saniflo Sanibest Pro is quite durable, and all of the components are fairly high in quality. The Saniflo Sanibest Pro does feature quite a unique flushing system. It is called an up-flush gravity system that is combined with a grinder and macerator. 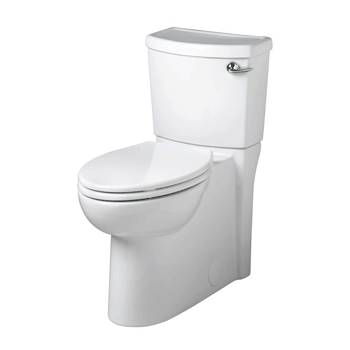 To explain, first off, the water from the toilet tank passes through the bowl, just like with any other standard toilet. The water, along with all of the waste in the bowl, then gets ejected out the rear into the macerator tank. Within this tank, there is a pressure system which recognizes when the flush has been activated. This pressure system then turns on the macerator blades, as well as the heavy-duty grinder which is included with this particular model. The blades and grinders turn solid waste into tiny particles. There is then an impeller and pressure system which shoot the waste out of the disposal, and it is strong enough to carry the waste up to 25 vertically to the next sewer line. The Saniflo Sanibest Pro is not the worst to clean, as it is quite efficient and effective. Yeah, the toilet itself will need some cleaning liquids and a scrubber brush, but nothing too intense. The macerator chamber itself does not really require much cleaning. You might want to take it apart every now and then for cleaning, but this is really only if you notice that it is not working at full efficiency. That said, if you do need to take it apart, cleaning and maintenance can be quite extensive. Something that we definitely appreciate about the Saniflo Sanibest Pro is the fact that it is super-efficient when it comes to water consumption. This particular toilet and macerator chamber combo only requires 6 liters, or about 1.6 gallons of water for every flush. The reason for this is because the macerator and grinder pulverize waste into tiny particles, which means that much less water is needed per flush. When it comes down to it, a normal toilet can use up to 4 gallons of water per flush, so this saves more than 50% of water per flush, a very economical and eco-friendly option no doubt. In terms of installation, realistically, you should probably have a plumber do it for you, as there are a few connections and parts that need to be put together properly. Although, if you have basic knowledge of toilets and plumbing, you could probably do it yourself. With that being said, you do have to have a water supply to connect to the tank of the toilet. You also need to have a power supply nearby in order to plug the macerator chamber in, as well as an outtake drain to connect the tubing of the macerator. What is convenient here is that the Saniflo Sanibest Pro can be installed up to 25 feet below the sewer line, which is definitely quite convenient. What is also neat is that you can install the drainage systems from a sink, shower, bathtub, and washing machine into the macerator chamber. Our overall rating for the Saniflo Sanibest Pro is a solid 4.7 out of 5. 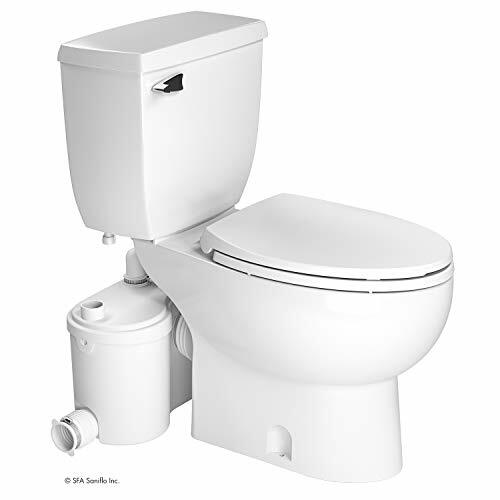 This toilet is made with durable parts, it saves water, is fairly easy to install, and is a good all-around toilet option to keep in mind.